Peace Corps, the opportunity to travel to another country and serve, was always a dream of mine. My mother introduced me to service. She put me in Girl Scouts as a child, and when I got older the two of us would go to soup kitchens and retirement homes just to serve. By time I got to college, I was volunteering on my own just for the love of it. During college I held positions of vice president and president of Alpha Kappa Alpha (AKA) Sorority. My experience there prepared and inspired me to apply to Peace Corps, with the sorority’s motto uppermost in my mind: “Service to all mankind.” My family, friends, and professors at Northern Illinois University were very supportive in my preparation for Peace Corps. Bernadette Chatman helps English learners in Tonga. 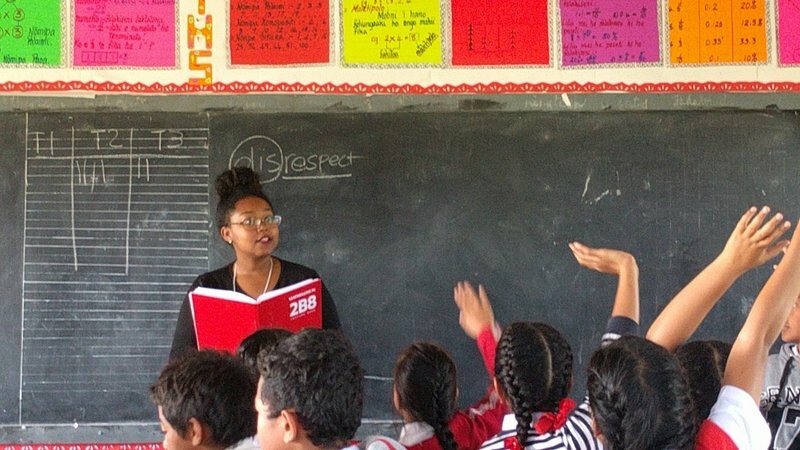 As a Peace Corps Volunteer I live in one of the largest villages on the main island of Tonga, where I promote English learning in the primary schools. Unlike most education Volunteers in Tonga, I teach the entire school day, from 8:30 to 3:30 p.m. After school I play with my students and show them new exercise games. I teach evening school until about 5 p.m. and then head to the different churches in my village and help youth practice for skits or dance performances. On Fridays I travel into town to help the Ministry of Education develop special education programs. On Saturday mornings, I help a fellow Volunteer with his reading groups. My students have impacted my service a lot. Their smiles and laughs are contagious and make teaching them ten times more worth it. Whenever I’m feeling sick or sad, or missing home, my students are the ones who brighten my day and help me with whatever I need. One success story is my student, Tu'i. Many people looked down on him because he was placed in a less advanced class than his peers at the beginning of the school year. I happened to notice Tui's talent for drawing, and asked him to contribute illustrations for books targeting early English learners. We worked together on his drawings every day for about two weeks. When I showed Tu'i’s final work to his mother, she cried and told me how much confidence he had gained in the classroom. At the end of the school year, Tu'i passed his final exam and surprised everyone with his good grades in English. Bernadette's students "make teaching ten times worth it." I love Tongan culture. They don't call Tonga the Friendly Island for nothing! People here believe in putting others before themselves. They also enjoy sharing their culture, which has helped me integrate into the community. I absolutely love learning the many traditional dances and watching people perform. 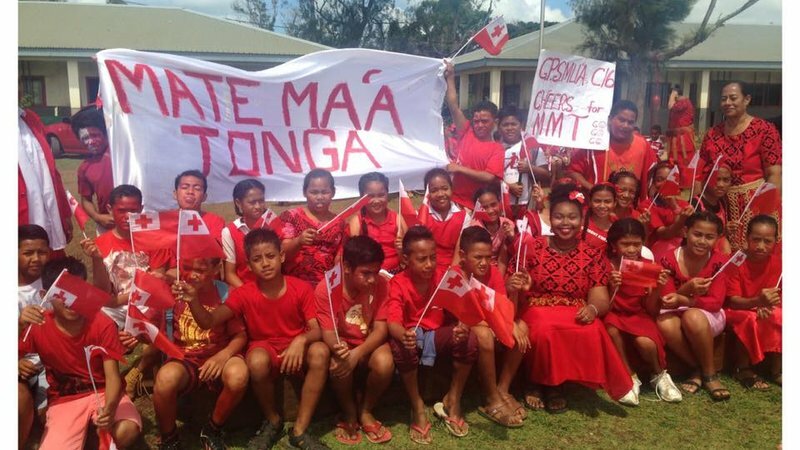 I want more Americans to be aware of Tonga and its unique culture. Peace Corps has been in Tonga for over 50 years now, so Tongans have some understanding of Americans. However, many Tongans still believe that anyone born and raised in America must be white. I have had many conversations about our land's original people, Native Americans, and the people of many different ethnicities living in America. As a Black female Volunteer, I have made it my goal to share with Tongans what it is like to live as a person of color in the U.S., and the many achievements of Black Americans. Being a Black Volunteer has been both a help and hindrance in my service. Most locals feel more comfortable being around me because I’m not a palangi (person of European descent). On the other hand, when it comes to work, some locals would rather listen to the white Volunteer. I used to get very frustrated with that. But I truly think it’s because there are too few people of color serving, so host countries have little experience with them. Nevertheless, my students admire the fact that I am a woman of color who is making an impact. Bernadette and the teachers at her school in Tonga. 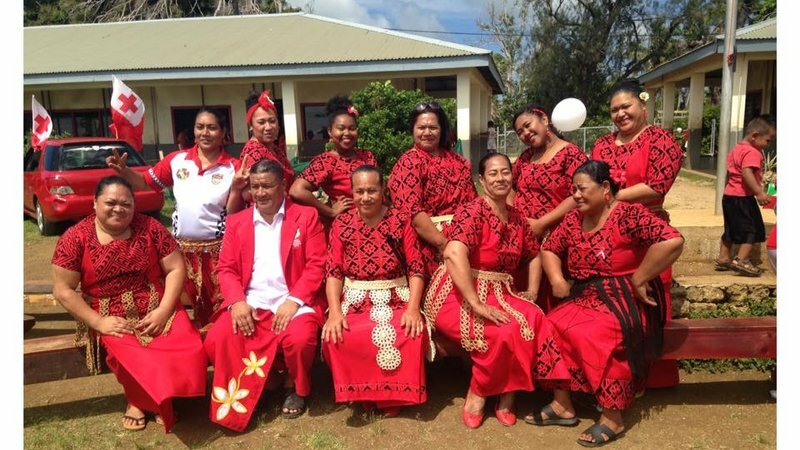 Before coming to Tonga, my plan after completing service was to get my master's degree and teach in the U.S., but service has opened so many new doors for me. Teaching in Tonga has challenged me be more creative in my lesson planning and also with classroom management. Peace Corps has also help me sharpen my grant writing skills, gain experience pitching projects, and take my passions to higher levels. I’m not sure what my next step after service will be, but I no longer want to just teach in the classroom. I want to work for Peace Corps, an international youth development NGO, or an organization focused on education for students with disabilities. Bernadette Chatman is serving as an education Volunteer in Tonga (2017-19). She has a B.S. degree in education from Northern Illinois University.